Have you ever been ready to give up on something you planned for your family vacation, but later are REALLY glad it worked out? Coral Pink Sand Dunes State Park in Southern Utah was one of those experiences for my family. It was Spring Break. We had already been driving for hours, and despite reasonably good signage, we managed to pass the turnoff to Coral Pink Sand Dunes. We instead found ourselves on a dirt road in Arizona – not for the first time on this trip, but that’s a story for another post. We agreed that if we didn’t easily find the turnoff on our way back to Highway 89, we were skipping Coral Pink Sand Dunes. Our kids were getting a little surly in the back seat, which made us almost hope we didn’t find it. Then we saw the sign and I insisted we turn in, amid a chorus of complaints. My kids changed their tune once they saw those big hills of colorful sand. We had to drag them away. Score one for Mom! 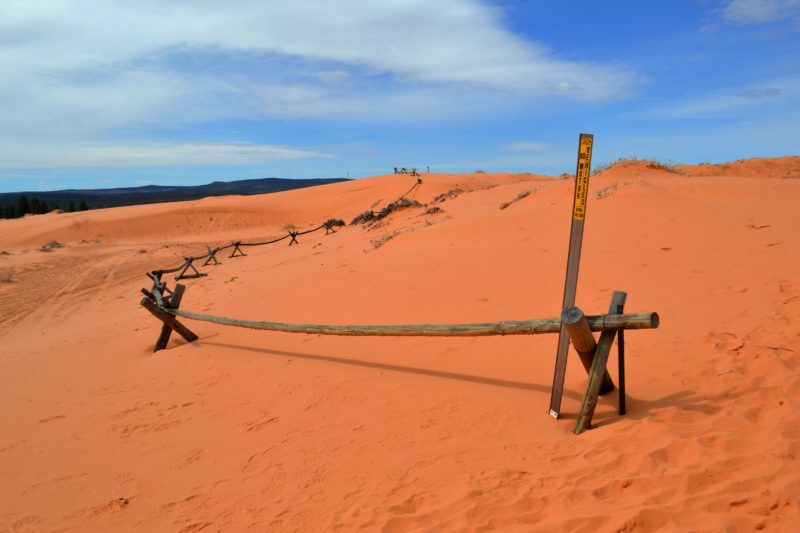 There are no formal trails at Coral Pink Sand Dunes. Visitors are welcome to explore the 1,200 acres of sand dunes on foot. My kids set their sights on the biggest hill and climbed to the top. They ran down and climbed up again lots of times until they had just enough energy to walk back to the car. It was just what we needed! Expect to find coral pink sand in shoes, pockets, hair and everywhere else by the end of your visit. It’s proof of a successful family adventure! A family near us brought sleds and sand toys. The sand was soft and clean. I agreed with my kids that this would be a really fun place to visit with friends or cousins. You’ll find an accessible platform with bleachers and informative signs within a short walk of the day use area. There are several good science lessons to be found at Coral Pink Sand Dunes. These dunes are created when wind blows through a notch between the mountains and erodes the sandstone. It’s called the Venturi Effect. Wind constantly moves and changes the dunes, so the landscape will change from year to year. The sand is brightly colored because of iron oxide (rust) and other elements found in the sandstone. We did not see wildlife during our stay, but the dunes support a variety of plants and animals. Keep your eyes open for the Coral Pink Tiger Beetle. You won’t find this insect in nature anywhere else in the world. About 90% of Coral Pink Sand Dunes State Park is open for ATV and dune buggy use. All of the park is open for hiking and playing in the sand. Signs and a fence make it clear where ATVs can ride. Riders and pedestrians are expected to share the dunes. The park was uncrowded on the day of our visit, so there was plenty of space for all. The biggest dunes we saw for hiking, running and sliding were in the shared area. We saw ATV tracks, but no ATVs during our afternoon visit. If I had young children playing with sand toys, I could have easily found them a safe spot inside the fence, nearer the parking lot. Day use and camping facilities at Coral Pink Sand Dunes are not large, but they are fairly new. I was surprised to find new built-in gas grills and covered tables at the day use picnic sites and camp sites. Bring your own propane tank if you’d like to use the grill. There is a fire pit at the group picnic area. The bathrooms in the day use area are clean and modern. Hot showers are available in the camping restrooms. The visitor center is very small. We just spent a few minutes here – long enough to browse the few low-tech exhibits and ask the ranger a few questions. Where: 22 miles west of Kanab, Utah on Sand Dunes Road (Highway 43). Follow the signs from Highway 89, and you shouldn’t have much trouble. Coral Pink Sand Dunes is an easy side trip from Zion National Park. When: Open year round, but spring and fall are the best times to visit. Wild flowers peak in June. Summer can be very hot, making the sun soaked sand too hot for bare feet. Winter can be chilly with occasional snow. Need a place to stay? We have stayed at Zion Ponderosa Ranch and Resort in Mount Carmel and Parry Lodge in Kanab. Both are one-of-a-kind properties, which we liked. Read my full review of Zion Ponderosa HERE. Parry Lodge is a quaint hotel that once hosted A-List Hollywood celebrities in the heart of town. Read more reviews and check rates for both at TripAdvisor or Booking.com. Need a rental car? Budget and Hertz offer up to 40% off when you choose Pay Now at booking. Hi Allison! I’m an Alysann too, it’s just spelled with “Ann” at the end because my mom’s middle name is Ann and my grandma’s name is Ann. Anywho, I just wanted to mention two things you could include when touting the fun to be had at the Coral Pink Sand Dunes. One is that there are pools of water that host pollywogs (tadpoles) in the spring. We took seven home with us during Spring Break and raised them to maturity. My children enjoyed watching them develop. I’ve seen blogs describe these seasonal pools if you want to find out more information about them. Also, I know that there are native american petroglyphs near there. My mom and dad (who live in Kanab) took us there years ago. I’m sorry I can’t be more specific about the location in relation to the dunes but I know it’s close. I’m going to take my kids to Glitter mountain (pit) soon. Thank you for the tips on that! Hi Alysann, and thanks for the tips! We just returned from Kanab, but didn’t get back to Coral Pink Sand Dunes because the summer heat was a little much. I’d love to find the pools and petroglyphs on our next trip. THis place look so spectacular! Was it hard to get the pink color out of clothing? Bridals here would be amazing and I’ve got a ton of ideas but I’m worried about the color on the white dresses? Rust runs everything. We did not have trouble with stains. The sand was warm and dry and brushed right off. However, we were wearing jeans and tees, not a delicate white gown. It does seem like a neat place for bridals. I’d love to see one if you decide to go here! Is there any place to rent dunes buggies to ride in the dunes. Hi Robin. I don’t have personal experience with renting dune buggies or ATVs, but Kanab’s visitor site offers a list of ATV tour/rental companies who may be able to help. Learn more at https://www.visitsouthernutah.com/ATV-Tours I believe that Off-Road Outfitters (AKA Coral Pink ATV Tours) is the closest to Coral Pink Sand Dunes. Their website is http://www.coralpinkatvtours.com.